Over the last few months, I've had a lot of conversations with parents who are worried about their kids being spoiled or becoming spoiled -- about the fact that the opportunity and abundance in their lives is contributing to a problem that can’t be undone. Subsquently, I've been thinking a lot about this topic and have been assembling some notes on what has worked really well for us. 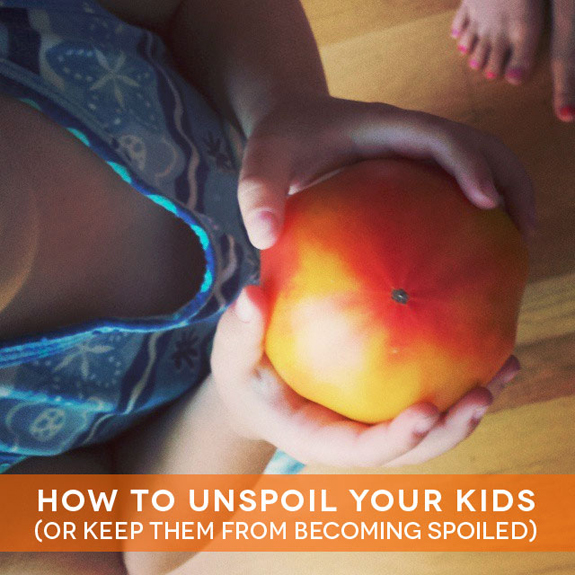 Here are 10 tips for how to unspoil your kids (or keep them from becoming spoiled). I'd love to hear your thoughts via the comments below too! 1. Let go of your baggage. One thing Asha and I talk about in Minimalist Parenting is childhood baggage and how this baggage can impact decision making. For example, growing up in an immediate family of 9, things like owning a bicycle or signing up for swim lessons were impossible and little luxuries like ice cream cones were exactly that -- little (rare!) luxuries. I subsequently wrestled hard with not letting my baggage impact what I bought or did for Laurel early on. However, once I identified that Jon and I are the compass for our family -- not the ghosts of my past -- I was able to move on and not make choices that purely served to compensate for what I didn't have as a kid. 2. Remember that you can make change at any time. I've heard from parents of older kids that they feel sunk -- that it feels too late to undo the spoiling effect. This is not the case at all. Will there be resistance? Probably. But remember you are in charge of this bus and if you engage in the tips below, you will be able to change course. 3. Talk to your kids about time/money/family impact before signing up for things. One thing I have learned over the years is that every single decision we make for one family member impacts the entire family system. Though Laurel used to be averse to extracurriculars, now she would sign up for everything if she could. Now, every time an opportunity comes up, we talk about the time/money/family impact and Laurel needs to make a choice. The process has helped her not assume that the world is all yes all the time. 4. Opt for less. One simple way to both make your life easier and unspoil your kids is to opt for less. Sign up for less things. Buy them less stuff. Start by lowering the bar an inch or two at a time from wherever you are. 5. Give them an allowance. And make them use it. One of the best ways to teach kids about money is to give them an allowance and make them use it. I don't believe in allowance for chores, but every week we give Laurel an allowance and then she needs to draw from that if she wants to buy anything that’s not a necessity. Hands down, this is the simplest way to teach kids about valuing money. They think a lot longer and harder about a $10-$20 purchase if they need to pay for it themselves. 6. Have them chip in. 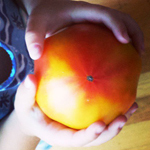 If your child wants something big, have them chip in. This year Laurel has learned to play guitar and we started discussing getting her a guitar. The thing is, it wasn't her birthday or a holiday, so buying an instrument seemed extravagent. Laurel was really excited about the idea of having her own guitar though, and to help make that happen she offered to chip in $80 of her savings (which I'll admit, kind of blew my mind) and also agreed to forego allowance for a while in favor of getting a better quality guitar. This situation has not only taught her about investing in something valuable, but I don't think it's an accident that she's played her guitar every single day since taking ownership. 7. Make them work. I recently saw someone post on Facebook, asking whether people thought she should make her teenage child work. I was admittedly surprised that this was even a question! Whether it's a paper route or scooping ice cream (my employment of choice in high school), nothing will teach your kids to appreciate the value of money more than earning it themselves. 8. Engage your kids in service. Help your kids see beyond themselves by engaging in service. Whether it’s a neighborhood cleanup or something more formal, explore volunteer options. 9. Let them be disappointed. It’s OK to say no. It is, in fact, your right as a parent to say no! And it’s OK for your kids to be disappointed with your decision. These days it seems to me that many parents worry about letting disappointment enter their kids' lives. Keep in mind that you will give them a gift by teaching them about disappointment so they can cope with it in the future as they grow. 10. Be consistent. Like so many things with parenting, consistency is key. If you're not consistent with your behavior, your kids will know that things are negotiable. Remember you are driving the bus. Just be consistent with your actions and your kids will learn along with you. Do you have other tips? Please feel free to share them via the comments below!